Serendip Chalet is located on top of a mountain with a pine forest in the back within the central mountain range (almost 900 meters above sea level) in Nilambe, Galaha. The chalet is equipped with all modern conveniences and makes a stunning spot for family and friends to relax, unwind, and rejuvenate completely. The chalet location is also an ideal romantic break for two. Take a breather and get away from your hectic lifestyle for a mid-week holiday or during a weekend and immerse yourself in the beauty of the natural surroundings amidst the cool air at the mountain top. Breathe deeply the fresh air floating in from the pine forest that borders the chalet and enjoy panoramic views of the valley below and mountain ranges far away. In the evening observe the mist that begins to gather from the ground up of the pine forest, enveloping the surroundings and creating a sense of enchantment. Serendip chalet is about relaxing in a natural environment where you are free to explore the surroundings on foot without boundaries…from a high energy trek exploring the forest to the more gentle pursuit of sitting in the balcony watching the changing scenery, we invite you to step into Serendip Chalet’s natural environment. We are sure that your holiday with us will be one of the best! The chalet is open for holidaying all year around and provides self-catering accommodation. Nilambe means blue water and the area is famous for its natural spring water. Serendip chalet has its water supplied from springs deep in the forest. The chalet is cozy, offers great value, is ideal for unwinding, and has a cool and refreshing year-around climate. 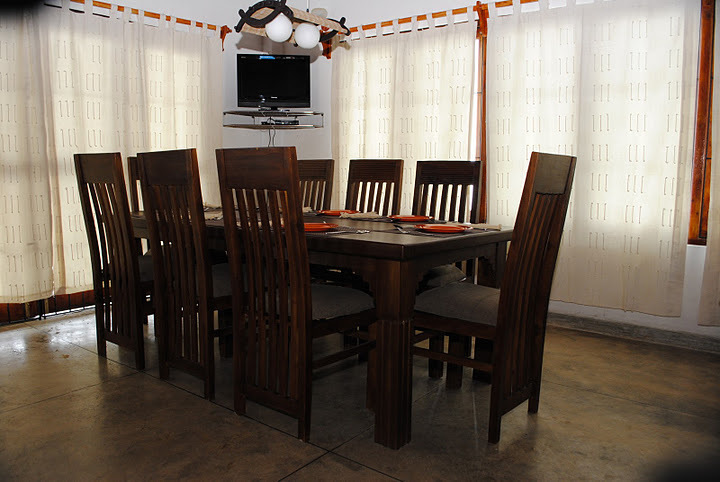 Comfortable accommodation is offered for up to eight adults and includes a fully functional kitchen. The chalet caretaker is available (at a nominal fee) for those guests who bring their own provisions and wish to have hearty Sri Lankan dishes prepared. From the Peradeniya roundabout the turn off to the chalet is 16 Kms along the Galaha road. You will pass the Peradeniya University with its buildings on either side. Upon traveling 16 Kms, turn to the left to enter the “Whispering Pines” development at the sign and go straight up the mountain for 2 Kms. The Serendip Chalet is at the very top and is a white washed house. Kids under 12 are accommodated free of charge with accompanying adults. Because of the number of beds, the maximum number of adults allowed per night in the entire chalet excluding driver is eight (8). Maximum occupancy excluding driver is ten persons (10) for the entire chalet.